← Why do I Write by Taylor L Stimac, Excerpt, and Giveaway! Happy Valentine’s Day! Today I’m spreading the love by participating in two blog hops. The first hop is sponsored by Hilary Grossman it’s fill-in Friday. 1. Valentines is a wonderful day of the year for chocolate. 2. Since Valentines is a sign of love I give all my loved ones chocolate. Don’t miss out on the fun. Visit Hilary’s blog to find out more. And now for the second blog hop. Today Debdatta at bOOk r3vi3ws is sponsoring a spread the love for Indie Authors. I love showcasing Indie authors on this blog and it was difficult selecting just one. I’ve met so many wonderful people since I’ve self-published and I’m honored to call many of them my friends. One Indie in particular has been super supportive. We email each other almost every day and yet we’ve never met in person. Don’t you love the power of blogging. Hilary Grossman is not only a fantastic blogger and friend, she’s a wonderful author. 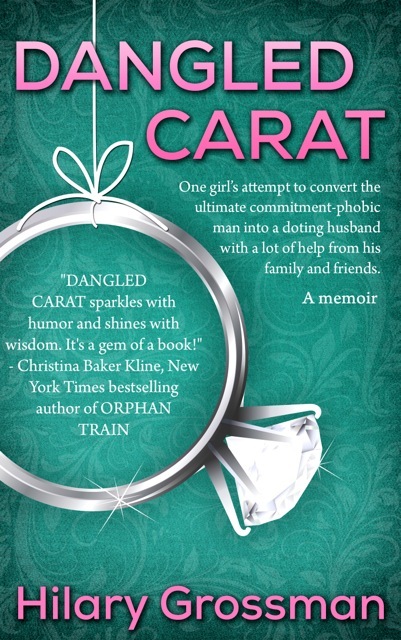 When I published my first novel, Beth Ann introduced me to Hilary who was preparing to publish her memoir: Dangled Carat. Hilary and I started chatting via email. At first it was mostly about publishing but then a friendship blossomed. Being an author can be a lonely road to travel at times. Most of my days are spent sitting down in front of my computer shut-off from the outside world. Not only is it lonely, but it’s downright terrifying at times. Hilary is always there for me when I have a panic attack, when I get a bad review, or for just about everything. And I hope I’m always there for her. Being an Indie author doesn’t mean we have to go it alone all of the time. Trust me, in this biz, you need friends who’ll talk you off that ledge when you want to throw in the towel and quit writing, promotion, and all the other details you never considered until you start. Hi! I am Hilary! I dated a guy so commitment-phobic that I was able to write a book about our relationship! 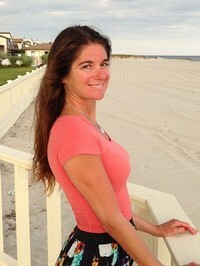 I am also the CFO of a beverage alcohol importer and live on Long Island. here are some random facts about me…. Hilary had gotten used to dating the commitment-phobic Marc, thirteen years her senior. They had a great relationship—why rush into things? She saw no need to pressure him for marriage, believing that when the time was right, he would propose. But after they had been together for four years, their friends decided to take matters into their own hands, pushing Marc to propose and making Hilary realize how much she really did want to marry the man that she loved. Unfortunately, Marc still wasn’t ready—and their friends’ meddling in the form of a faux engagement party led to a disastrous New Year’s Eve that brought their relationship to an inevitable turning point. In this relatable, lighthearted, and playful memoir, Hilary reminisces about her life before Marc—from the insecure and awkward teenage years she spent in a back brace and dealing with the loss of her father, to her early relationships and, finally, to the day she met Marc and realized that she really wanted to see him again. Through their first date—even though Hilary was technically seeing someone else at the time—and the ease of their early time together until Marc first decided that they were moving too quickly, up until that fateful New Year’s Eve, Hilary shares the details of their relationship and how Marc’s inability to commit led her to find an inner strength and confidence she didn’t know she possessed. What are you waiting for. Please visit Book r3vi3ws to enter. The contest ends in 14 days. This entry was posted in Blog Hop and tagged Dangled Carat, Giveaway, Hilary Grossman, Indie Authors, Indie Love Blog Hop. Bookmark the permalink. 31 Responses to Happy Valentine’s Day: Two Blog Hops! I wish I could hug you right now….Because what you wrote about me is what I feel about you…. I don’t think I could have done “this” without you. And when I feel panicked or on the verge of tears you are the person I want to speak to first! Happy Valentine’s Day! And I would like to add, thank you, for always being there for me. I won’t lie, this can be a scary job at times and having someone who has gone through it and who can help me laugh instead of cry over silly mistakes or bad reviews is awesome. I love all of your chocolatey answers!! They made me smile :). Ok, I’m off to enter the contest! You had to know I’d fit chocolate in somehow. Good luck! Hmmmm….I think you like chocolate! LOL. Nice to meet you TB. I may be addicted to chocolate 😉 Very nice meeting you Lisa! I keep saying I need to read more funny stuff. Actually, I’ve been having a difficult time because I like to write somewhat whimsical, light hearted or snarky voices, and my current series doesn’t leave a great deal of room for that. Guess I’ll have to fill my quota by reading, eh? Are you working on the sequel to Moonless? That one does sound intense, but good! You are a true chocaholic, TBM! Make sure you eat plenty this Valentine’s Day! I can’t wait to read Hilary’s book. I read about it somewhere else, but I can’t recall. Hilary’s book is fab! Hope you get to read it soon. And I had loads of chocolate last night and there’s more for me today. Have a great weekend, Jill! Thanks Jill. Hope you had a wonderful weekend. yep, you had me at chocolate. it’s only noon and I have already consumed enough to send me into a coma. Love Hilary! I just loved her story. Isn’t Hilary’s book awesome! I laughed so much and it was great learning more about her. I hope the chocolate coma doesn’t last too long–my advice, eat more chocolate 😉 Have a great weekend! Even as a good I loved chocolate. My dentist doesn’t agree, but who cares! Hope you had a great night and happy weekend! I’ll be in Germany this summer. might have to do a taste test. I never ate much chocolate before I met my wife — she’s escorted me over to the dark & milk chocolate side. I used to skip on dark chocolate–not any more. Glad your wife brought you to your senses. I am a chocoholic too. 🙂 Hilary’s book sounds awesome. I’ll have to check it out. I hope you enjoy her book. I loved it. I had so much chocolate Friday, yet I’m still not sick of it. I’ve been eating it all weekend. Me too! and I might have some this morning with my tea. I saw Hilary’s book featured on another blog recently. So cool how she’s been such a great friend to you! A four-day weekend. That sounds wonderful. I may even forego chocolate for a four-day weekend. Maybe not.